I went in to Black Mass knowing there was a lot of hype to live up to. Ever since we saw our first look of Johnny Depp as James “Whitey” Bulger, people have been asking the same question: could Johnny Depp be staging a comeback? Regardless of the roles he’s taken recently, I’ve always been a huge fan of Depp. Black Mass was my most anticipated movie of the fall. But did it live up to expectations? 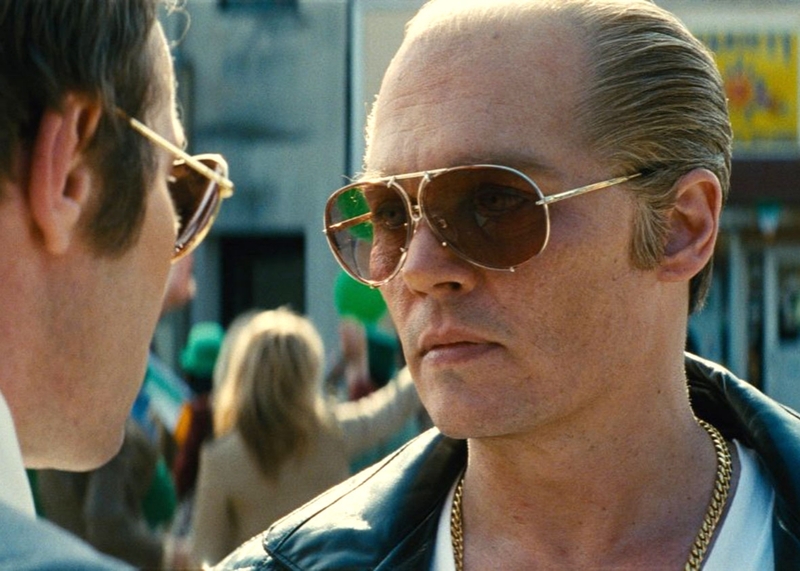 Black Mass tells the story of the notorious South Boston gangster, James “Whitey” Bulger, as he enters into an unholy alliance with the FBI in an effort to snuff out the Italian mob. So does it live up to the hype? While it may move pretty slowly, Black Mass boasts extraordinary characters, career-best performances and a tension-infused story. Each star in Black Mass is at their best, and the director shows a mastery of tension I haven’t seen in a film since Whiplash. Johnny Depp terrifies as James “Whitey” Bulger. Whenever people talk about this movie, Johnny Depp is going to be the first name that comes up in any conversation, and rightly so. This is, hands down, Depp’s best performance in years. My personal definition of a good villain is someone who makes you fear for everyone’s life the minute he/she walks on screen, and Johnny Depp’s portrayal of Whitey Bulger fits that description perfectly. He’s unpredictable and menacing, and you can’t help being slightly afraid of him. Another standout out in the movie is Joel Edgerton as the FBI agent, John Connolly. To me, Edgerton’s always been the man in the background who’s good at what he does, but he comes out swinging here. He’s better than I’ve ever seen him before, and he plays off Depp wonderfully. While the story is interesting, it’s the characters that serve as the movie’s driving force. Whitey Bulger is human, and as such, we see him have occasional glimmers of decency, which I very much like. But what I like ever more is how the movie makes it clear that while Bulger has moments of humanity, they’re not his defining ones. Black Mass presents us with the “hero’s journey” flipped to favor the bad guys. Instead of a seeing a hero who struggles with inner demons but eventually emerges victorious in good, we see a villain who goes through bouts of compassion, but ultimately stays evil in the end. Likewise, John Connolly goes through a similar paradigm shift in character as his department becomes more intertwined in Bulger’s schemes. All of this is laid out in a fascinating and distinctly noticeable manner. Joel Edgerton as John Connolly. And what gangster flick wouldn’t be complete without some well-placed tension? The story of Black Mass is generally interesting, but it primarily plays to the violence and corruption that took hold of Bulger’s life, giving us a look into some of the most brutal moments in the mobster’s history. This man does despicable things, so whenever he’s around; you know something could happen at any moment. This tension is emphasized by the somewhat polite manner that Depp’s character gives off. At one moment, you may be completely at ease. But then in the next moment, you could easily be on the edge of your seat, worried sick about what will happen next. If you haven’t figured this out by now, allow me to fill you in: this is a dark movie, so prepare yourself for that. The story, as interesting as it was, shot itself in the foot early on. Black Mass provides a fascinating retelling of history, but it never really succeeded at completely drawing me in due to a major storytelling choice that kept a great movie from being an amazing one. In the very first scene of the movie (and of the trailer as well), the story is framed in the context of Whitey Bulger’s former thugs telling law enforcement all about the history of their boss. This is something that could have been–and sometimes was–done really well. But overall, it ends up killing any sort of momentum the story can pick up. I find that in movies, it’s far more entertaining to be shown something that to be told something, and this story element allowed Black Mass to do a lot of telling. Just as things looked like they were picking up speed, the movie cut to the thugs so they could tell us about what happened next. Instead of seeing Bulger go from street criminal to crime lord, we get a shot of a thug telling us, “he went from street criminal to crime lord.” It was like having commercial breaks in the movie, and so for me, the story never really took off, even though it was interesting. It has one glaring flaw, but aside from that, Black Mass is a great movie that sticks with you. It’s put both Johnny Depp and Joel Edgerton in a position for Oscar buzz, and they deserve every bit of it. Black Mass is a story that, while a bit depressing, needs to be told, and I’d recommend it to anyone looking to see a great film this weekend.